The second demo at Charleston. 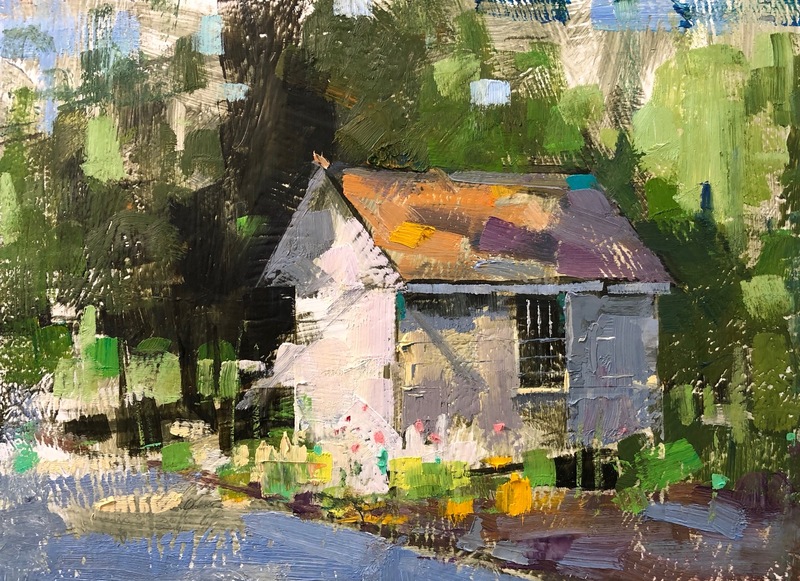 Painting a small house to show how to present linear perspective correctly. I have just finished a 3-day workshop at Charleston SC. I want to thank Laura Todd and Pat Huff for organizing this wonderful event. Thanks to all the artists for coming and painting with me. This is my first demo. BTW, I did go to see a dentist when I was in Charleston. I am OK now. Thanks to all friends' asking. 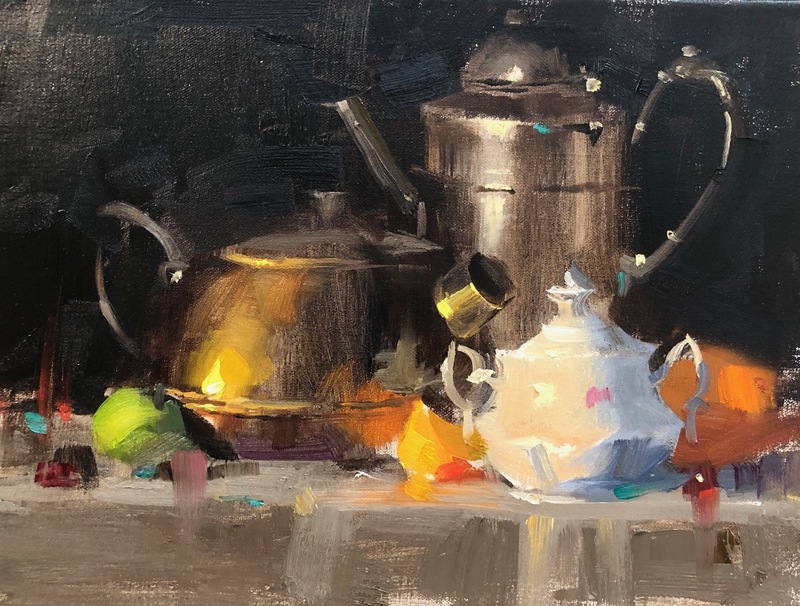 I would like to announce that I will teach a 4-day still life painting workshop in Austin on May 5 - 8, 2019. I want to share my know-hows on how to make a painting more dramatic. 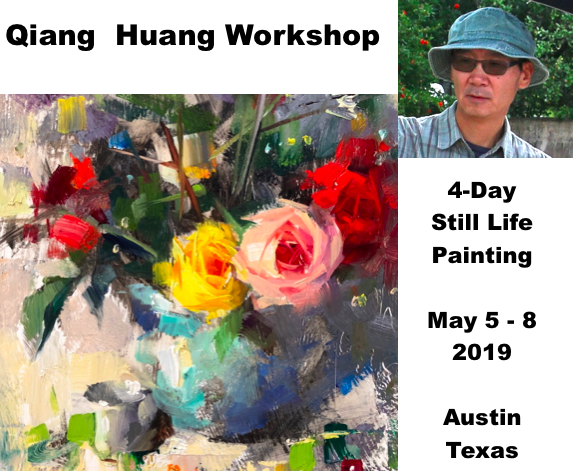 If you are an artist in Austin, or artist wants to come to Austin Texas in May, please take this opportunity to improve your painting skills. 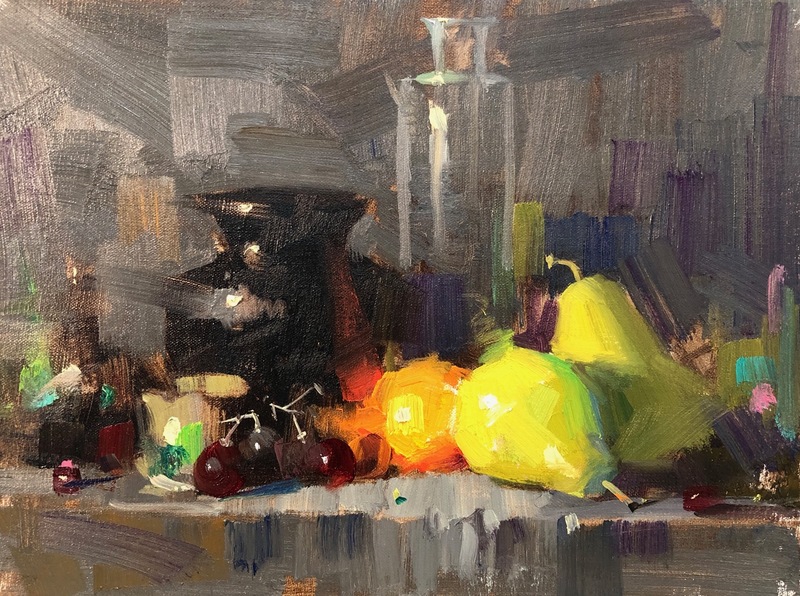 Please check the workshop webpage: http://www.qh-art.com/qiang-huang-2019-still-life-workshop.html for more information and sign up. Thanks. I have to interrupt my portrait study for a while. At this moment, I am sitting at the airport waiting for my flight to my next workshop teaching. This painting I did right after the New Year to give my still life painting a little change. I am exploring new compositions. Of course, I want to push the envelope of my colors. Obviously, I did not do a good job on my yesterday's painting, but I went to Whole Food and found myself a bowl of Chicken Noodle soup. It was delicious. I went to live painting again this morning. It happen to be the same model. I did better I think. Today, I have really experienced how a starving artist feels. Due to a bad toothache, I hardly ate anything for a few days. I felt very hungry today. 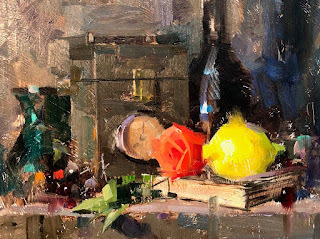 I wanted to go today's noon to 3:00 live painting, but I better find a bowl of soup (that is only thing I can eat) before I start to paint. I left a little early and stopped by 3 places: a Burger King, a HEB (grocery store), and a Jersey Mike's Subs. Man! nobody offers a bowl of soup. I was starving and arrived at the painting place late. I did all right. The painting has some problems. I finished this painting with some warm water and a tablet of ibuprofen. 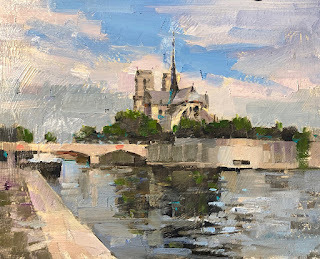 I was at Paris last May, and tried of painting the Notre-Dame plein air. I failed badly. The structure is so intricate. 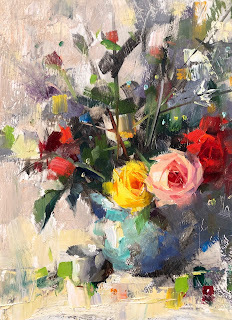 It is so difficult to simply and still make sense on canvas. I was pondering this problem since then. Yesterday I was reviewing my photos shot in Paris. This question came to mind again. So I give it try again. I think it works this time. My obsession of portrait painting keeps on going. 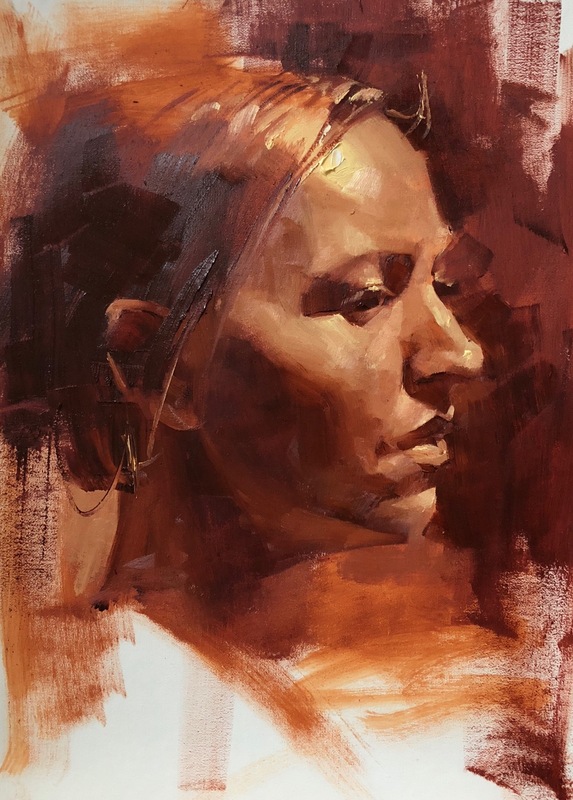 I went to life painting again yesterday. 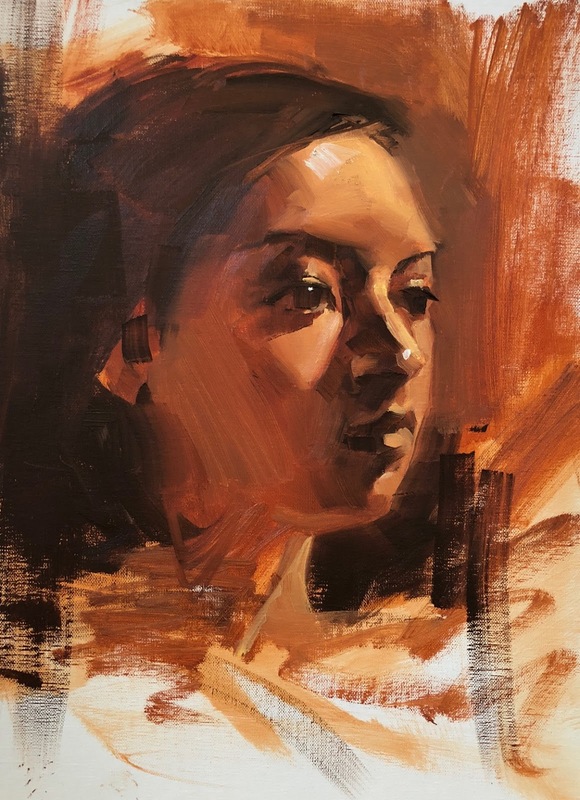 We had the same model, with whom I did "Head Study 010719" a week ago. I can see I am getting better noticeably (Don't you agree). I am much faster now, and start to have a procedure on how to paint accurate head studies. I don't want emphasize "loose" or "painterly" effects on this kind of studies. Portrait painting is totally different ball game relative to still life and landscape paintings. 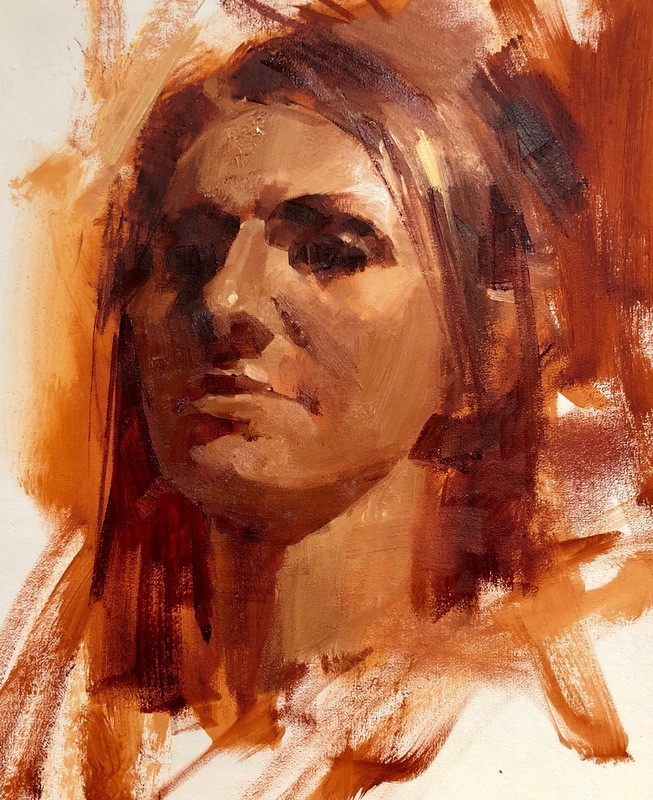 I also want to stay in this monochromatic scheme for a while until I really get anatomy of human face nailed. This is my last painting in the year of 2018. I worked on paint application, using more broken color techniques to increase the feeling of spontaneity and energy. 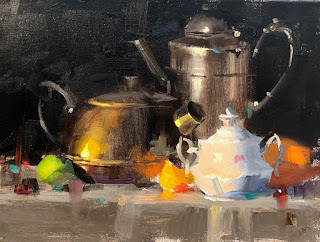 I review my journey on still life painting, I did a lots of repetitions, because most of my still life paintings are demos. My progress were baby steps. I sneak into my teaching a small amount of experiments. I learn a little bit every time when I teach. gradually cumulates my know-hows. I have waited for a long time. Now I start to see improvement. Gush! 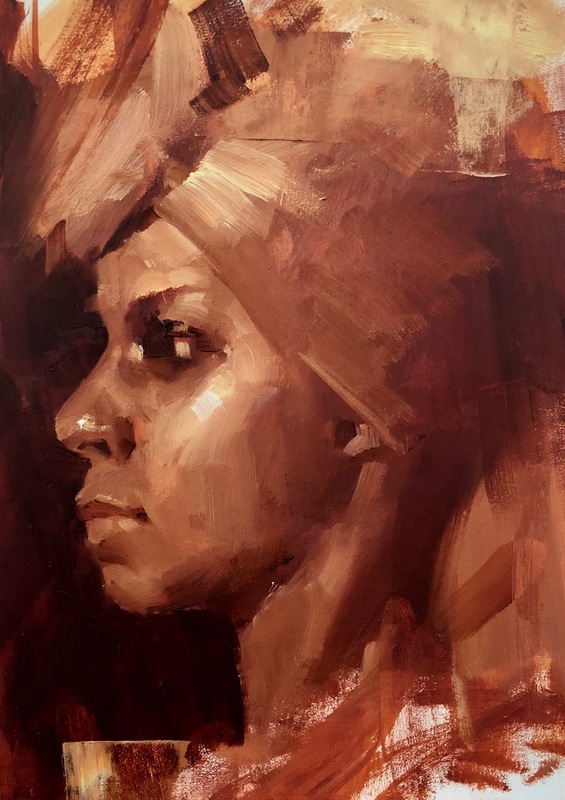 I am obsessed with portrait painting now. I painted this one this morning. I am working on two things in my head studies: solidity of the head form and anatomy of facial structure. I have done three head studies this week and have seen progresses. I hope I can have more time on this path. Wish me luck please. I think I have got Alzheimer's now. 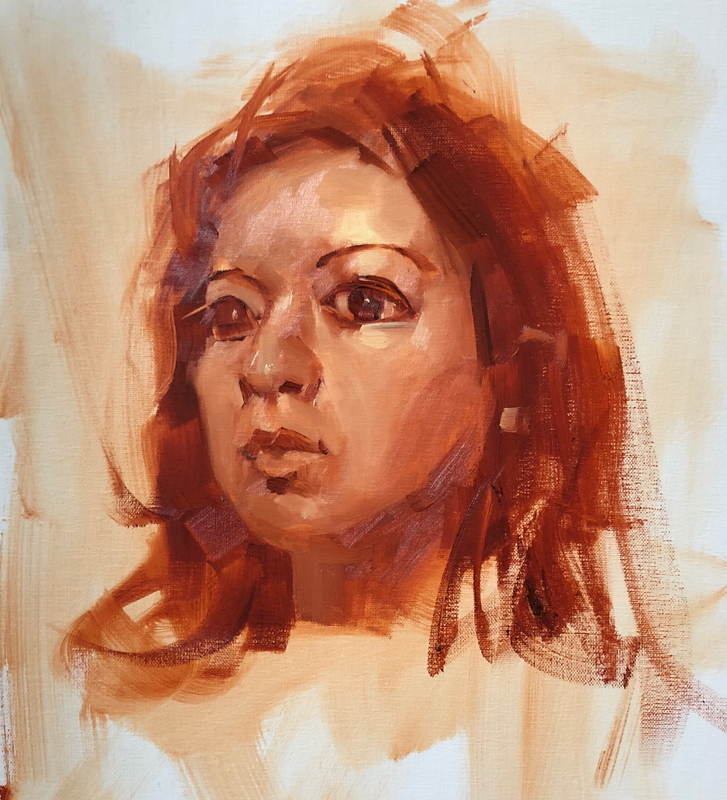 I went to life painting again this afternoon. 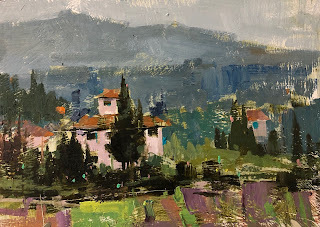 I thought I got everything I need, but when I arrived at painting location, I found I forgot to bring the brushes I like, I did not have a palette knife. I have not a container to hold mineral spirit. I even forgot to bring the tripod that hold my easel. 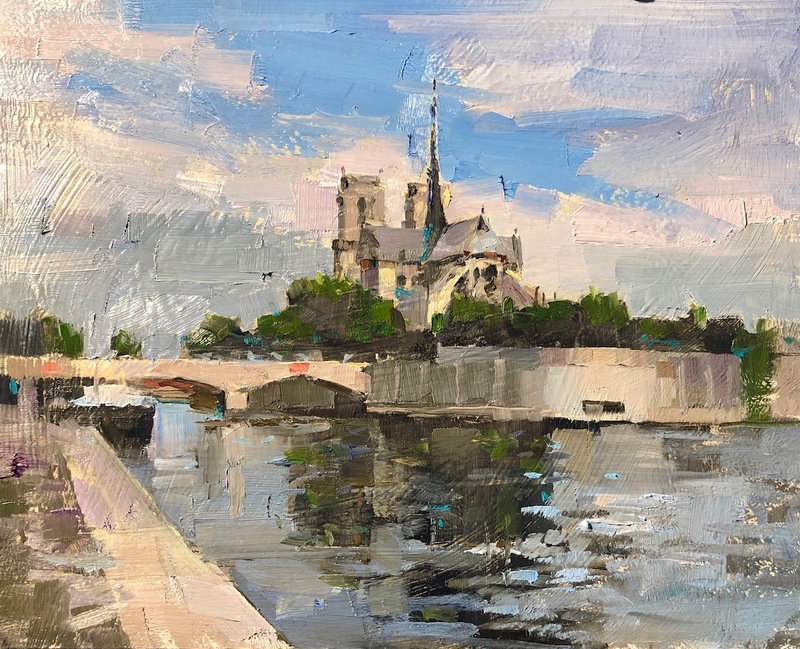 (Well, after the painting session, I found my tripod was in my car, but I have absolutely no memory that I had brought it). I had to borrow a palette knife and managed to finish. The painting turns out all right. The holiday is over. Go back to work. I continue posting my out-of-date paintings. 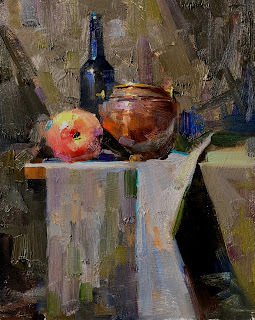 This one is my first demo on my workshop at the Scottsdale Artists School in December 2018. 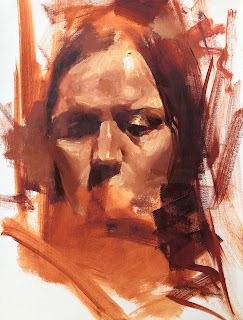 Since this is my second workshop of the year at SAS, so I call it demo 5. I had a relatively long break in this holiday season. I didn't paint. I re-read "Walden" by Henry David Thoreau, and decide to practice his idea literally. I started to build a small off-grid habitat with my own hands. This holiday season marked the very early phase of this long term project.